Sliders have become an essential tool for many free and premium WordPress themes. They allow you to highlight your key contents, publicize important information and show off your site’s cool photos and videos. Besides, they also are used for promoting the newly released products, displaying offers/discount or even highlighting the headline news. Sliders, being one of the most important tools for any types of websites comes inbuilt in most of the WordPress themes. 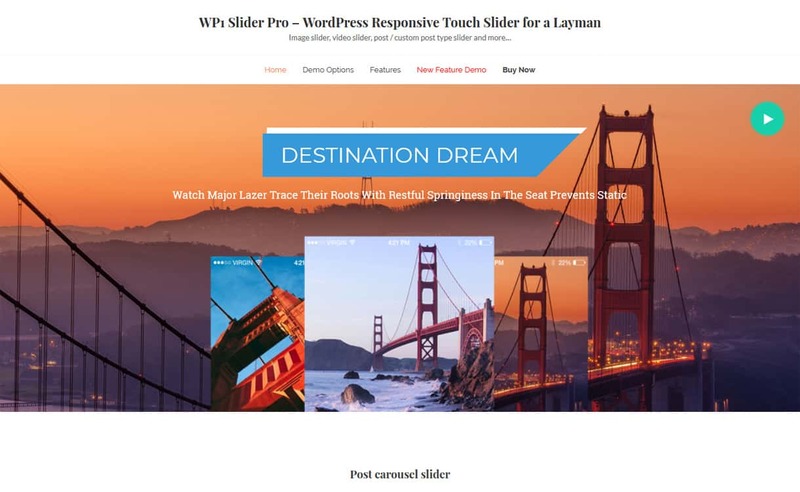 However, if you are using a website that does not contain inbuilt slider functionality then you can add it right away using the WordPress Slider Plugins. WordPress Slider Plugins are those WP Plugins that lets you embed your website with unlimited numbers of sliders. They come with multiple configurable options to configure the sliders and lets you highlight your site’s important content in a stunning way. Here, I have enlisted some of the Best WordPress Slider Plugins that allows you to add unlimited numbers of sliders on your website. They are well tested and are compatible with all versions of WordPress networks. Also, they come with tons of configurable and customization options to build mind-blowing sliders in very less amount of time. 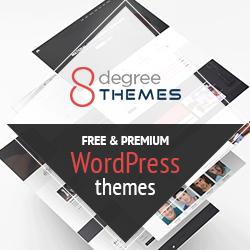 If you are looking for Free WordPress Slider Plugins then check out our collection of 10+ Best Free WordPress Slider Plugins. 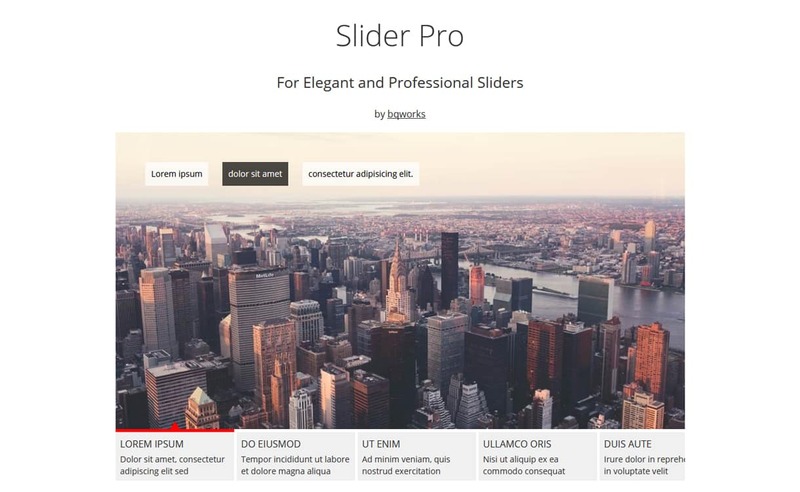 WP1 Slider Pro is a Premium WordPress Slider Plugin that allows you to add multi-purpose sliders on your WordPress site. It is easy to use plugin made targeting layman. However, the plugin contains all the useful features and you can create stunning sliders in no time. It is a highly customizable plugin containing multiple options. The plugin comes with 23+ animation effects, 15+ beautiful layout options and many more. Besides, the plugin also supports YouTube, Vimeo, HTML5 videos. Hence, you can create the sliders containing video background as well. Slider Revolution is an innovative, responsive WordPress Slider Plugin that displays your content in a beautiful way. It comes with drag and drop editor that lets you create sliders, carousel, hero scene, or a front page in no time. Besides, using the plugin you can also create a beautiful one-page web presence with tons of customizable and configurable possibilities. It is a responsive plugin that works great for any types of viewing devices like mobile, tablets, etc. Also, you will get the full control over the style, animations, and transition of the sliders you create on your website. 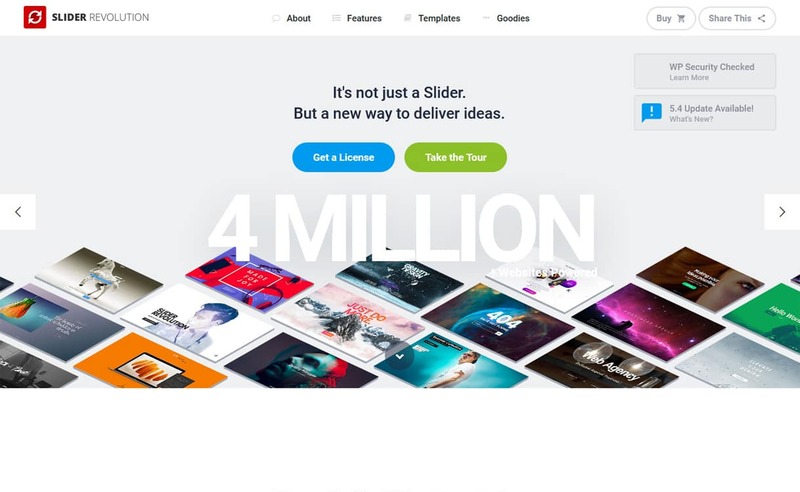 LayerSlider is a Premium Multipurpose Animated Slider Plugin that allows you to create mind-blowing slideshows, gorgeously animated landing page, or even a full website. It comes with drag and drop visual editor that makes you easy to create unlimited numbers of sliders without any coding skill. It is a fully compatible plugin that works well for all types of WordPress themes. Also, the plugin is highly configurable and comes with multiple importable templates that provide idea start point for new projects. 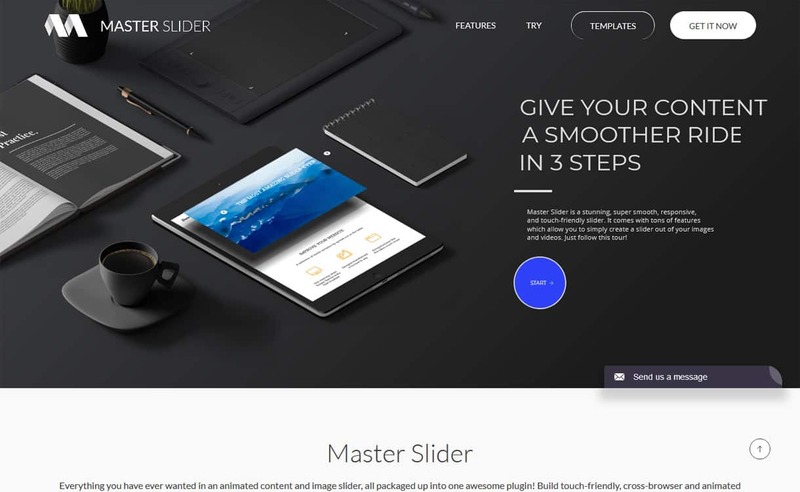 Master Slider is a Premium WordPress Slider Plugin that comes with premium images and content slider to provide super smooth hardware accelerated transitions. It is a touch navigation plugin that comes pure swipe gestures to provides you the great experience that you never faced before. The plugin is truly responsive and device friendly which works perfectly on all major devices. It allows you to create awesomely layered sliders as well as provide you the ability to add any types of HTML contents (texts, images,…) in layers. Slider Pro is a fully responsive WordPress Slider Plugin that allows you to create professional and elegant sliders for your WordPress site. The plugin is built with a clean and intuitive interface and smooth navigation option for providing a better experience to your website users. It is a highly customizable plugin that comes with animated layers and elegant effects. Besides that, there are multiple options for creating a cool environment on your WordPress site. There are thousands of Slider Plugins available on the internet. However, we chose the highly rated ones that comes with powerful and awesome features. Also, they are very popular and have very high sales. Is the article helpful for you? If you are using any of the mentioned above feel free to share your experience with us. Also, if there is any plugin you know is needed to be in the list feel free to write us about it. 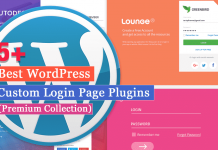 Also, if you are in search of other plugins you can check out our ultimate collection of The Best Responsive WordPress Tab Plugins. 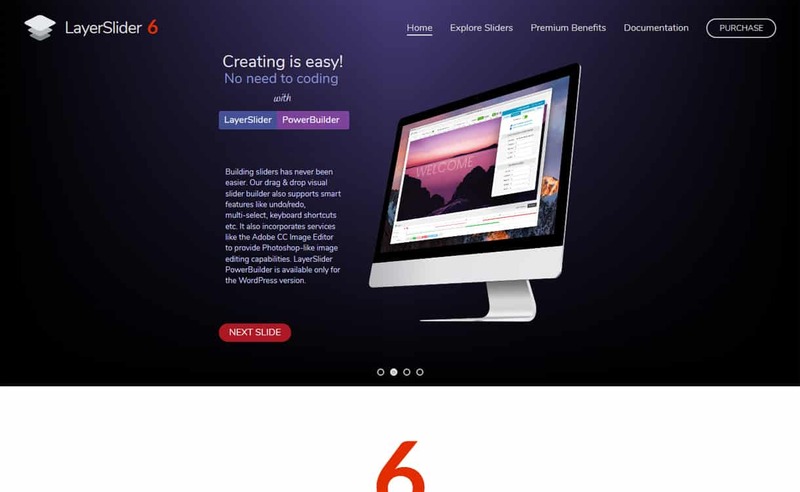 Hey Buddy!, I found this information for you: "5+ Best WordPress Slider Plugins (Premium Collection)". Here is the website link: https://wpallclub.com/best-wordpress-slider-plugins/. Thank you.